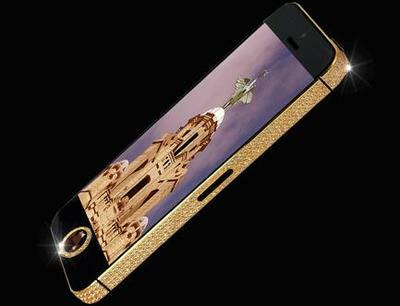 If you’re one of those iOS haters who complain about Apple selling yesterday’s specs for top dollar, then I need to brace you for this one: The world’s most expensive iPhone 5 has been produced, and the value of this gold and diamond handset is so far beyond the reach of mere mortals, it would even make your garden-variety millionaires gag. In fact, if this were on the market, it would literally wipe out the bank accounts of many CEOs and venture capitalists. So what is this obscene show of excess worth? Well, when you factor in the solid gold, and white and black diamonds, you’re looking at a cool £10 million, which is roughly about $15.3 million USD. This is the work of UK-based luxury designer Stuart Hughes, who designed the phone at the request of a Chinese businessman who wanted to take a family heirloom — a rare 26-carat black diamond — and incorporate it into the handset. Along for the ride is an inlay of 600 white diamonds, an Apple logo made of solid gold and 53 white diamonds, and a screen that features 135 grams of 24-carat gold and sapphire glass. And last but not least is the businessman’s black diamond, which swaps out the iPhone’s standard home button. This isn’t the first time Hughes has tricked out an iPhone. 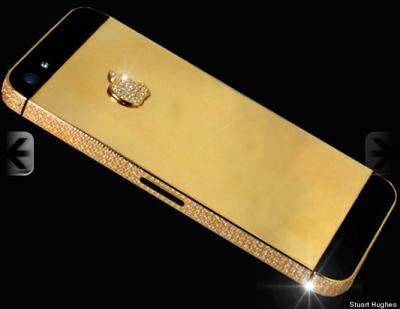 His iPhone 4S Elite Gold phone previously held the title of world’s most expensive iPhone, with a value of £6 million (or about $9.18 million).